There is no question that electronic medical records ( EMRs) can be very useful. They allow doctors to take much better care of patients , because they allow him to record all the important medical information he needs– and he can review this whenever he wants - even from his smartphone. Knowledge is power, for everyone - the doctor; the patient; caregivers; and the healthcare system. However , what seems to be a great solution in theory often falls flat in the real world – especially when the amount of noise contained in the EMR drowns out the information it contains. 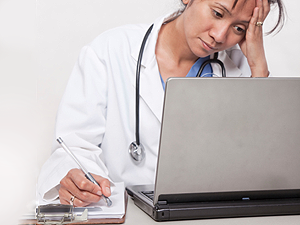 Most doctors hate EMRs, because they are so difficult to use – and the reason for this is that they were originally developed as tools to enhance revenue collection , rather than to improve medical care. Not only does this reduce their productivity because of the learning curve, they also need to change the way they take a history. This is a huge challenge, because it’s hard for doctors to change their clinical habits. It’s also very unfair to expect them to do this, which is why so many are so resentful about the fact that they are being forced to use EMRs. All doctors would happily use an EMR which they can modify in order to suit their personal style. While all EMR companies promise that it’s possible to customize the template, in real life this is a huge pain. The doctor has to raise tickets and send these the IT dept for any changes, and these tweaks cost time and money. Most just get fed up and give up. Even worse, the mindless templates create a tick box mentality, so that doctors start focusing on completing the EMRs expeditiously, rather than providing high quality clinical care. Documentation starts detracting from the patient and hurting the quality of care, rather than enhancing it. flow . EMRs are designed by software engineers , who treat doctors as being intelligent . They believe that once they’ve given them an efficient software tool - a software program which has been proven to work well in one clinic - then doctors should be smart enough to change their habits and start using the program , so that they can achieve the same degree of efficiency and productivity in their own practise. They just cannot understand why doctors refuse to invest the time and energy in learning how to use the program properly and blame them for being uncooperative. However, doctors are creatures of habit , and they hate being forced to change . This personalization and anticipation will allow EMRs to become much more usable; and allowing this kind of learning will set up a positive virtuous cycle, because the more the doctor uses the EMR, the more it does what he wants it to ! The doctor will be able to complete the record much sooner, because this has now been tweaked to his personal preferences. Software engineers need to remember that doctors are knowledge workers , just like they are ! They have their personal quirks and idiosyncrasies , and we need to respect and honor these. A great real life example of this is SwiftKey, which is a keyboard tool that autocorrects and offers bespoke next-word predictions. SwiftKey Flow offers the “ mind-reading capabilities of a personalized prediction engine with the convenience of data entry on touchscreen devices “ . Using this tool, it’s possible for the EMR to know with high probability what the doctor is going to type in next. The trick is not to force doctors learn new skills and new software programs, but to make the programs more intelligent , so that they can adapt themselves to the way the doctor works. PraxisEMR has also done a great job of implementing this. Effectively, each doctor creates his knowledge base in the process of practicing medicine, consistently improving the speed of documentation with each additional case. It’s simple – but not easy ! The good news is that now that most EMRs are hosted on the cloud, it’s possible to use anticipatory computing and adaptive learning, so that the EMR gets modified and customized transparently and painlessly on the fly for each user, without having to involve the IT dept at all ! You are absolutely right! The modern EMR/EHR systems are not intelligent and not because they are template based, but because they do not have two key components: ability to follow the rules defined by physicians and learn from the experience (statistical data). Once my friend – an ophthalmologist - invited me to go with him into the operating room to watch a complex retina surgery he performed. While I made many very interesting observations, one was about the way he interacted with his operating nurse assistant. During the surgery he would raise his hand and she would place into it one of many instruments available from the surgical table. Moreover, she was holding the needed instrument BEFORE he raised his hand and most of the time this process was performed in a complete silence. So after the surgery, I asked my friend how the nurse had known what he needed every single time. He shrugged his shoulders and said: “First, I taught her and second, she has worked with me for many years”. That simple! – Just follow the rules and learn by experience. Medical science is not precise and physicians practice differently within commonly adopted boundaries, but medical software developers endlessly try to place them into Procrustean bed of what they think is right. Even those EMR/EHR producers that use doctors as their advisors and proudly advertise their products as being “developed by doctors” end up with systems acceptable for those advisors but not to the rest of the clinicians. Why not instead to give the physicians and their staff some easy to use tools to define the rules and collect statistical data of their patterns for the software to follow? And what about data availability? Indeed, even when a physician steps into an exam room to see a new patient, there is a lot of information already collected in advance or during the triage performed by a physician assistant. In the case of an established patient, who has come to practice for some years, there is even more information available. And if the visit is a follow up after a procedure or a surgery – the complete set of options is known. As doctor proceeds with the examination the amount of data narrows the options even further. The software does not have the purpose of replacing a doctor, but limiting the screen presentations to only what is relevant at each moment of the encounter may squeeze everything needed into a single screen instead of forcing the doctor to click multiple times just to get to the needed screen presentation. And long lists of diagnoses, laboratory tests, medications, etc. may be shorten to a few items – some used more often even pre-checked so that in most cases the doctor just clicks a single Ok button. Software will perform many tasks much better than humans. For example, there are many medications and remedies acting similarly. However, insurance plans cover some and do not cover others and their preferences change often. It is obvious who is capable to better follow these insurance mandated preferences – humans or software. Another example is billing modifiers, which have to be added to the performed billing codes according to the strict and ever changing rules. Even the most experienced billers make mistakes, but the software will follow the rules again and again having 100% accuracy once the rules are precisely defined. Doctors should be freed from performing tedious tasks just to be compliant and accordingly paid. Let’s have the software to become their true helpers freeing their time to pay more attention to us – the patients.